Plot synopsis: In an out-of-the-way Mexican locale, theft and murder rear their heads when a trio of characters vies with each other to acquire $300,000 in stolen money. Review: A number of real-life couples appeared on Suspense (as well as on many other Old Time Radio programmes), including Fibber McGee and Molly, and Ozzie and Harriet Nelson. Yet perhaps the most well-known, at least for a modern audience, was Lucille Ball and Desi Arnaz, the two stars of this episode (who had previously appeared together in another episode, The Red-Headed Woman). However, unlike in their famous TV show, I Love Lucy - which began airing later in the same year that this episode was broadcast - here they do not play husband and wife. Instead, they play characters who spend most of the story as antagonists. It is interesting, too, to hear them both playing against type - not only are their roles not comedic ones, but they appear to be quite unsympathetic, being (seemingly) thieves and murderers. Unfortunately, though, apart from this point of interest, there's not much else to recommend about the episode, as it simply isn't very good. The plot is humdrum and the script is merely workmanlike; even the title is bland, and has little specific relevance to the story. The other major problem is that the sound quality of the only recording of the episode I could find was extremely poor, with hiss and crackling rendering some of the dialogue unintelligible. Still, luckily, Ball also starred in other, much better, Suspense stories, including one of my personal favourites, Dime a Dance. Plot synopsis: A man attempts to disprove Ralph Waldo Emerson's idea of 'compensation' - the belief that every action, good or bad, will be rewarded in kind - by committing a random, motiveless murder, which he believes will result in no ill consequences for himself. Review: The central conceit of this story is certainly intriguing, an exploration of the idea many will be more familiar with as the notion of karma. The episode also shares some similarities with the stage play Rope (adapted into the famous Alfred Hitchcock film, as well as an early Suspense episode) in that it concerns the idea of murder as an intellectual exercise, rather than as an act committed for personal gain or out of animosity towards the victim. The first act therefore leaves the listener keen to know how the story will play out. However, as the episode develops it starts to unravel, becoming more and more overwrought, and less and less believable. By the end, it has become faintly ridiculous, with a conclusion that isn't very satisfying; even worse, it undermines to some extent the story's original idea, of what effect getting away with murder may have on a man's conscience. A pity, as there were the seeds of a much better episode here. Plot synopsis: A man who wishes to be rid of his estranged wife, so that he can be free to marry another woman, comes up with a plan to murder his spouse - which leads him to concoct a scheme to make some 'easy money'. Review: I'll note at the start that the twist at the end of this episode is undeniably on the preposterous side. However, getting to this point is great fun. 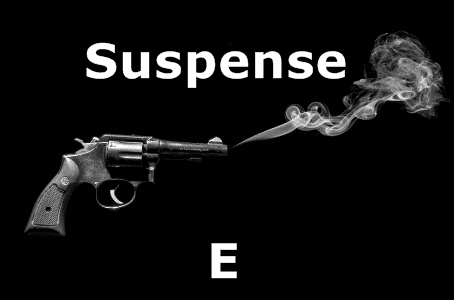 This is the sort of episode that Suspense at its best excelled at, a noirish crime story with desperate, self-serving characters, plenty of drama and intrigue, and snappy, fast-paced dialogue. As such, I was reminded of classic film noirs like Double Indemnity (even if this episode isn't quite in the same league), with its cast of greed-driven characters doomed to tragic fates by their own misguided actions. The actors all play their roles very well and the plot is strong, at least until the rather unbelievable ending ... which involves a parrot, a poisoning, and some very bad luck for the protagonist. Nonetheless, highly enjoyable. Plot synopsis: To pay off his gambling debts, a man marries a rich woman he does not love, but then begins to contemplate ridding himself of her so that he may inherit all of her wealth. Plot synopsis: A young engaged couple agrees to participate in a cruel experiment in which they are denied food for a week and must then abstain from eating a morsel of the food put before them for twenty minutes in order to win $20,000. Based on a short story by Stephen Vincent Benét, first published in Cosmopolitan magazine, in April 1922.
Review: This is a relatively faithful adaptation of Stephen Vincent Benét's very first published short story (more faithful, at any rate, than the version produced by Escape some years earlier). It is a dark study in human psychology in which a young couple puts their love to the test by undertaking a trial of endurance - forgoing food for a week - based on an experiment originated by a fifteenth-century prince. It's an intriguing premise, making this well worth a listen. However, I had a couple of problems with the story, at least in the version presented by Suspense. First, I wasn't particularly convinced by the test itself. After enduring seven days of hunger, is it really that big a deal to wait another twenty minutes to eat, even with food placed directly in front of one, for the sake of winning a very large sum of money? Human beings can, after all, survive much longer than this without food (Gandhi, for example, once fasted for 21 days, three times as long). As such, I don't know what exactly the test proves - the depth of a couple's love for each other, as the episode suggests, or simply their self-interest? Some might call this 'greed', but personally I think that for $20,000 (which today would be worth over $150,000) it is quite a rational decision for any couple to make to agree to undertake an experiment that requires not eating 'only' for a week - regardless of how much they truly love each other. Second, and here I offer a SPOILER ALERT!, the ending is a little disappointing. With this type of story, one expects some sort of twist in the tale, but there isn't one - it ends pretty much as one expects that it will. So, an interesting episode, but far from a classic. Plot synopsis: A young man working at a gas station is caught up in a series of murders that occurs in the small town where he lives. Review: The performance by Eddie Bracken in the central role is probably the main reason for listening to this episode. He offers a compelling portrayal of a decidedly odd young man who clearly has a lot more to him than there initially appears. There is, too, a lot of promise in the depiction of small town life that is presented, with its varied collection of supporting characters. Furthermore, when people start being murdered, the way that many of the townsfolk begin to organize and arm themselves to find the killer offers an interesting commentary on vigilantism. However, what disappoints is that the plot ends up following a very predictable course - in particular, it's made obvious from early on who the culprit behind the murders is. Moreover, the attempt to provide a psychological explanation for events is fairly simplistic, though perhaps at the time the episode was first broadcast this may have seemed more novel than it does to a modern audience. All in all, it feels as if there could have been more to the story than there is, though it is still quite an entertaining one. Plot synopsis: A new teacher at a high school tries to instil the importance of road safety into a wayward pupil.